Justa 10-minute stroll from the responsible luxury of ParadorResort & Spa, Playa Biesanz is one of Manuel Antonio National Park’s many attractions. One of the park’s moresecluded spots, it’s perfect for sunbathing or launching off on a kayakadventure. At low tide, you might even spot ancient turtle traps used by thelong-gone Quepoa Indians. Pristine nature, history, adventure and no crowds… Just what the vacation doctor ordered. Puerto Rico’s Isla Verde Beach is famous for its enormous crescent of golden sand and its non-stop parade of beautiful people. Its crystal clear water and swaying palms give way to some of the city’s top hotels, restaurants, and excellent nightspots, making it one of the metropolitan area’s most popular beaches. Hustling, bustling, and never boring, you can observe the local “wildlife” from thecomfort of your lounge chair as the San Juan Water Beach Club’s famous Water Girls bring you drinks andsnack, or you can take matters into your own hands and join in the party. Jetskis, parasailing, volleyball, paddle ball and yes, even salsa dancing—trustus, what happens in Isla Verde, stays in Isla Verde. Mexico is famous for many fabulous attractions, not the least of which are itsbeaches. If you’re looking for a place to hang ten on your own, with yoursweetheart, or with the kids, look no further than Sayulita on the Pacific Coast. Part of the area known as the Riviera Nayarit just north of PuertoVallarta, Sayulita’s surf beaches are great for beginners, moderates, and shredders. The town is a treat in and of itself: a very boho-chic hangout with lots of fun places to poke into and good restaurants. There are some great boutique hotels here, like Hotel VillasSayulita (awesome and zen) or Villa Amor(stellar for families or couples), but if you want something less boho and more luxe-living, the Four SeasonsPunta Mita has great beaches of its own and is only half an hour from thebreaks at Sayulita. 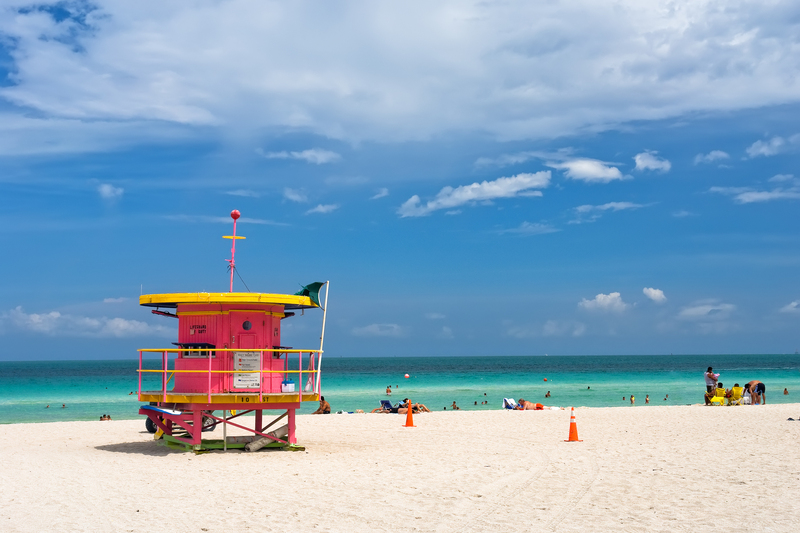 You’d be hard-pressed to find a sexier beach than Miami Beach in South Florida. Thishotspot’s awesome beach boasts light turquoise water and an entire drag of ArtDeco buildings full of high-end restaurants and chic hotels, but there’s nodoubt it’s the people watching that make it jump to the top of any cool traveler’s list. This is a place to see and be seen, so bring your beach body and yourdancing shoes and get ready to show off all you got. There are too many hotels to choose from, but we favor the landmark DelanoSouth Beach, with its Philippe Starck design, uber-trendy pool scene, rooftop spa, and hip nightlife. Atitude optional; dark sunglasses required. Ready to go? Get in touch with your Personal Travel Concierge at www.skymedtravel.com today!